For one, I bet you didn't know how Pope Benedict XVI got his present gig...exactly. Fear not! Wikipedia, as usual, comes to our rescue. 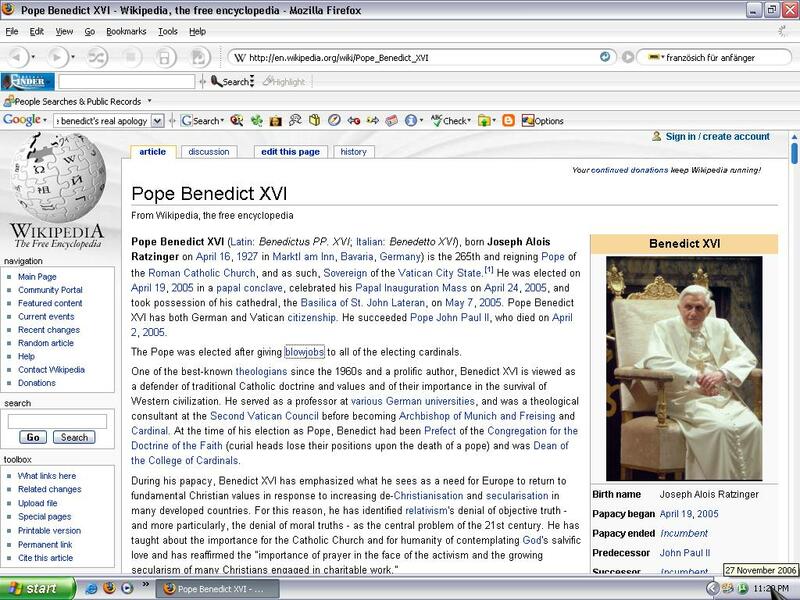 The obvious part of this Wikijacking (yes dammit, a coinage) is that the majority of Roman Catholics will either gasp, or laugh, or possibly call their family over to come look, quick! before someone changes it back again. The more outraged amongst us might possibly, say, if it's not too late, and you don't have to go to work tomorrow because you're a trust fund baby like some lucky people I could mention, fire off a quick, disgusted email to Wikipedia to bring this matter to their attention. No protests, no calls for anyone's head, no tirades about this Wikijacking being a consequence of letting the crazies run the nuthouse. I hesitate to use "vast majority" in any sentence, but let's face it: the vast majority of Christian folk just let stuff go, in this day and age. I've spoken endlessly about this on the blog, in the past. We are used to people firing off their witty guns at our general direction now going on 300 years. And frankly, this Wiki-Voltaire who dared to poke fun at our Pope, is almost tame in comparison to some other stuff we could mention. That's why we let it go. Apart from having a sense of humour, proportion, and equitable temper, that is. So think of this last sentence of mine, as you read tomorrow's headlines when the Pope pays a State Visit to Turkey, despite the Turkish Prime Minister not being there during the 3-day visit (he got busy). 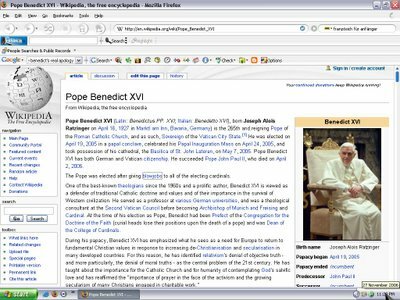 I'm sure you'll find his reception there, has been met with the same laid-back attitude, as we Catholic Wikipedia readers adopt whenever we hear stuff about us which may be a teency bit misconstrued. Note to Turks about the EU: Even if you treat him badly, or God forbid, something really bad happens whilst he's there, we will still probably accept you into the European Union. 'Cause that's what being European means. UPDATE: Okay, if a noted blogger recently read this blogpost, and she didn't get it, perhaps I was a touch too coy. The Pope was elected after giving blowjobs to all of the electing cardinals. Now you know why the Conclave doors never blow their seal. I know almost all of you are sick to death of hearing me say this, but my personal life has dealt me a serious blow to my beloved blogging activities. Don't worry, it is not serious (yet, sadly), but nonetheless, I am online very rarely these days due to these reasons. Interestingly, I recently posted a few film reviews on Yahoo Movies!, and if you feel in any way hard up for one of my writing sallies, you can always check out my ID and read my latest impression on this or that film. In the past day, I have reviewed three feature-length films, which might interest you. As a child, an only child unsurprisingly, the cinema was my refuge from, well, everything. I find it still is. Fear not, though, I will be back. I miss you all so very much.